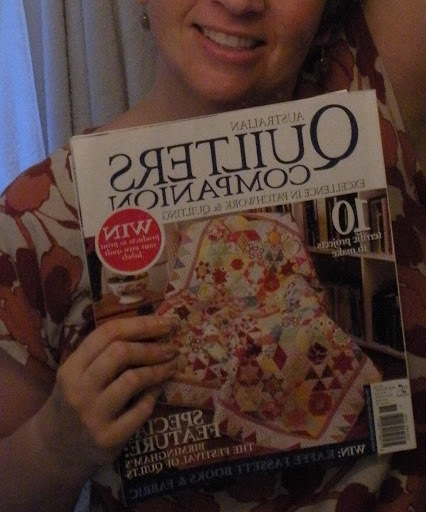 It’s the elusive Australian Quilters Companion, Vol. 5.2, No. 18 with the gorgeous Candied Hexagons quilt on the cover! Lorraine, my sweet, sweet, generous, Cupcake Swap partner from last summer sent me this in the mail all the way from Australia, just because she knew I was looking for it to make this quilt! 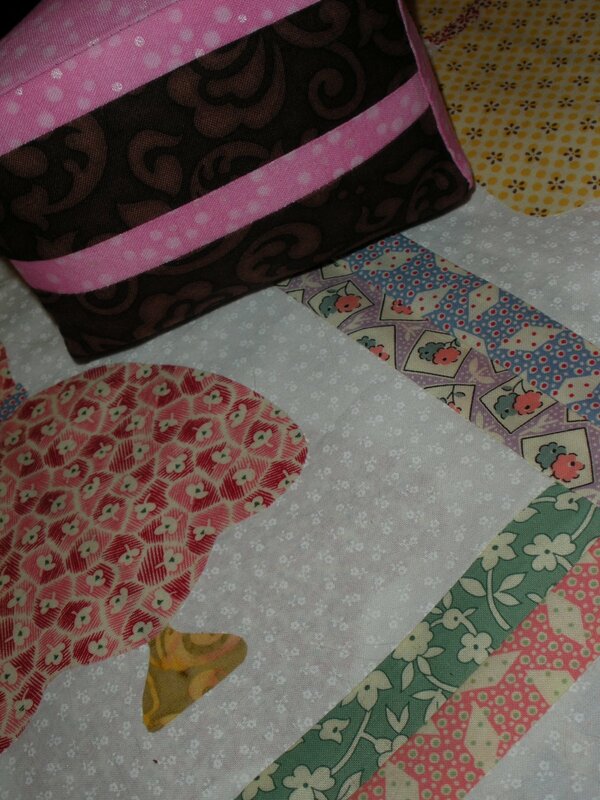 This is going to make re-creating this quilt SO much easier than making it from the photo as I originally planned! (Sorry, for some reason that photo will not stay flipped!) This happy mail day followed a weekend involving a mini-retreat and two glorious days of sewing…. Now that is a good week, my friends! LUCKY YOU!!! 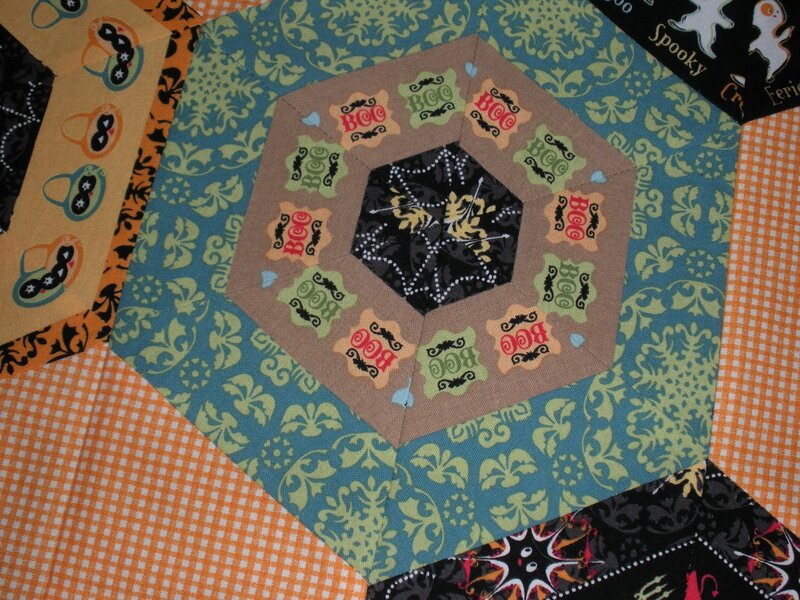 I've admired that hexagon quilt over and over and have tried in vain to find that issue online. I'll be watching your progress closely to try to pickup a few pointers. Gotta love those retreats. They're the best time to make progress–and catch up on a little chatting now and then. Glad the magazine arrived….hope you enjoy making the quilt….not much stitching here….I have been “hit” with a headcold that has left me very much under the weather…starting to feel better today….after a day off work…..back to it tomorrow though..retreats are awesome aren't they….sounds like you had a ball and even did some stitching…looking forward to seeing more pics….! That's fantastic, you are so lucky to have got the magazine, what a nice friend you have. I hope you have as much fun as I did making it! I think I recognise the sneak peeks and love them both. That's awesome! I have the Candied Hexagons on my list to start when this semester of school finishes. Tomorrow! Was planning on doing as you had and manually figuring it out. I'll be back though to see if you have any tips and as you share your project. And Lorraine, if any of your quilting buddies have this same issue they'd like to pass along, I'd be forever grateful too! Omgoodness I have only just discovered this quilt and I am tearing my hair out trying to find a copy of the magazine. I have searched high and low and still have not found a copy……off to ebay to see if there is one. Love your fabric choices and off to look at your blog to see your progress. Thank you for sharing.